If you know anything about me, you know that I love to bake... and especially bake for the holidays! But having a little cracker Jack in tow has made that a little bit more difficult for me this year. Instead of elaborate macarons, I've resolved that I need to find easy, but still festive recipes - which is exactly why these snow capped cookies are so perfect! These snow capped cookies are so easy to make and take no time at all - a win win for my baking and baby holding heart. And if you're like me and looking for even more time savings, just buy the break-and-bake cookies to pop in the oven (or hey, just buy premade cookies from the grocery store!). 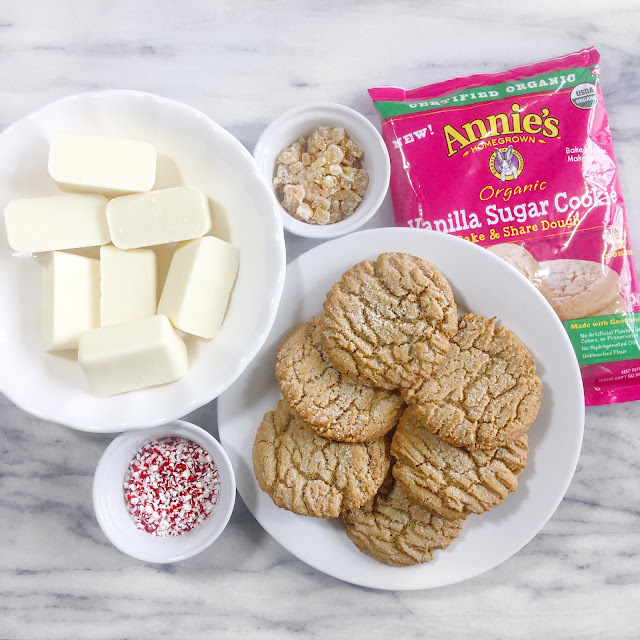 All you need to make these snow capped treats are cookies (I used ginger snaps and sugar cookies), white chocolate (or almond bark), and whatever toppings you'd like (I used crystalized ginger for the ginger snaps and crushed candy canes for the sugar cookies). 1. Before beginning, make sure your cookies are fully cooled. 2. Melt the almond bark per the instructions on the package. 3. Dip half of the cookie in the almond bark. 4. Lay on wax paper and sprinkle with your candy. 5. Let the almond bark fully cool and harden before removing from the wax paper. And ta-da! You've got yourself some "fancy" cookies that took no time at all... how's that for efficient holiday fun? You can make the cookies extra special by placing them in fun packaging before giving to your neighbors, friends, and family. By the way, how gorgeous is this doily?! My grandma makes the most beautiful handmade doilies that serve as the best chargers... love, love, love! Want to make your cookies extra fancy? Put them in fun packaging before delivering to friends and family! Below are my favorite packing ideas from Pinterest. I looove frosted gingersnaps, but I love the idea of doing peppermint sugar cookies-- the toppings are so pretty! I love those jars with the stacked cookies, and what a great idea these cookies are to liven up refrigerated dough! These present so well and I'm sure taste even better than they look! My sweet tooth is out of control lately!!! You're a genius. That is all!! !